Laurel Landing is a wonderfully cozy private mountain cabin. Nestled in the heart of the Great Smoky Mountains, you will feel at peace when you enter the door. It features authentic chink logs, wood burning stove, Comfy Queen beds in both bedrooms, nice clean spacious bathroom, cable TV, telephone, internet, fully equipped kitchen and 4-6 person hot tub! While secluded in the woods, there is a partial winter view of the mountains along with the sound of a nearby trickling stream. What more could you ask for? Small dogs are allowed with an additional pet fee. 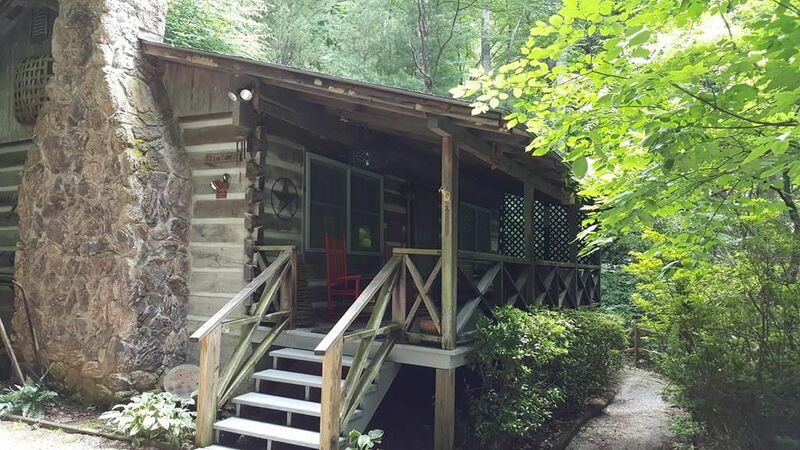 Laurel Landing cabin is available for 1-3 month rentals for a discounted rate in the off season. There is so much to do around this cabin, all year-round. 15 Minutes Away: Located within 15 minutes are the historic Downtown Waynesville, scenic Blueridge Parkway, Cataloochee Ski Area, Tony`s Tube World (snow tubing), Wheels Through Time (historic motorcycle museum, as featured on History Channels "American Pickers"), Ingles Grocery Store, Walmart, and several great Restaurants. 30 Minutes Away: Within 30 minutes are Asheville and the Biltmore Estates & Winery, several local micro breweries, Cherokee, Harrah`s Casino, Smoky Mountain National Park, Pisgah National Forest, several golf courses, Bryson City (home of the Smoky Mountain Railway and "Polar Express" during the Christmas Holiday), Transylvania County (home of the most waterfalls in the United States), and over 100 Antique Shops. 45 Minutes Away: Also, within 45 min from Hendersonville where you can visit Sierra Nevada Brewery (with enormous dining Tap Room), gem mining, white water rafting, ziplining and much more. 1 Hour Away: Just under 1 hr of Gatlinburg, TN and Pigeon Forge (home of Dollywood).